The head of psychiatry at Stanford said, among other things, that one of the best things that a man could do for his health is to be married to a woman, whereas for a woman, one of the best things she could do for her health was to nurture her relationships with her girlfriends…Physically this quality “girlfriend time” helps us to create more serotonin – a neurotransmitter that helps combat depression and can create a general feeling of well being. I find this fascinating. (Sorry guys.) And it reminds me of a recent dinner at Food Wine & Co in Bethesda where we turn a couples night out into a gender-segregated dining experience. I have put off my visit to the year old Food Wine & Co due to an early rotating roster of chefs and fairly mixed reviews. Then things seemed to pick up. Friends were sending me reports of some very good meals. It becomes a no-brainer decision to dine here before an evening at Roundhouse Theater with four other couples. We have divided ourselves into two groups with the five women on one end of the table and the men on the other. This way the men can discuss sports and recent episodes of Curb Your Enthusiasm, and the women can catch up on what’s happening with our kids (and our feelings about what’s happening with our kids.) I’m wondering whether I should be embarrassed to admit this seating arrangement, or if it is perfectly acceptable among couples who have all been married for 25 years or more. Then I read the email about girlfriends and suddenly it’s not only okay, it’s good for our health! Who knew? On the women’s side of the table three of us opt to share a salad of roasted beets, whipped goat cheese, and roasted pistachios along with a bottle of wine. 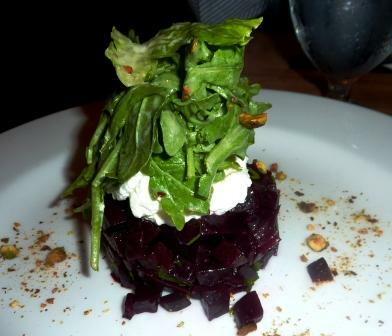 I am becoming a bit predictable when it comes to beets and goat cheese. And who but close girlfriends will tell me that I’ve been over ordering beets lately, and then let me do it anyway? This is a perfectly fine rendition of the dish, and the presentation is beautiful. However, I feel like it could use something to dress it up flavor wise. My BFF and I decide to share a lamb burger and a salad with crispy tuna. I am fortunate to have a BFF who inevitably will end up wanting to order the same exact things as I do, and who is willing to share her food with me. The lamb burger is adorned with harissa, tomato confit, arugula, and garlic mayo. The harissa provides the necessary zing. I am content with my half of the burger and I enjoy the side of freshly made chips. BFF is more health-conscience than I am, which unfortunately leaves more of the chips for me (which may mean that girlfriends aren’t always so good for your health after all). 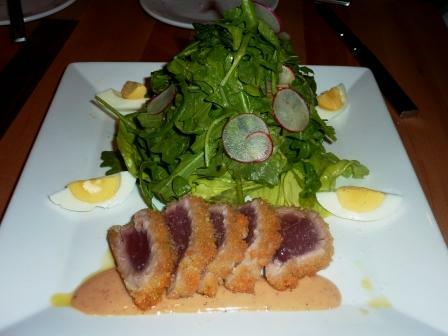 The crispy tuna is accompanied by bibb lettuce, arugula, haricots verts, avocado, and mustard vinaigrette. The tuna itself is prepared well. The outside of the fish is indeed crispy and the sauce isn’t bad, but the salad is a real snooze. 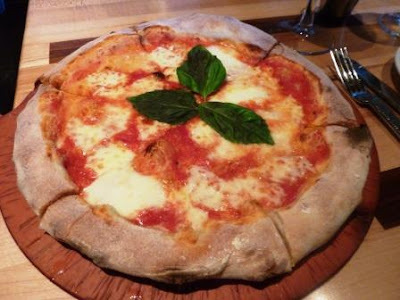 At the other end of the table, the men have shared a margherita pizza, which they all agree is bland although they give points for the crispy crust. I try to secure a bite so I can form my own opinion, but my request is denied. Thanks, gentlemen! 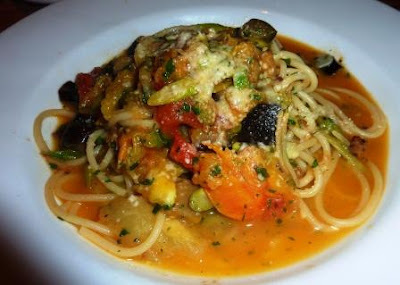 My husband – who is down at the far end of the table- has spaghettini with asparagus, heirloom tomato, eggplant, and parsley which he tells me later ends up being a lifeless dish with lost potential. 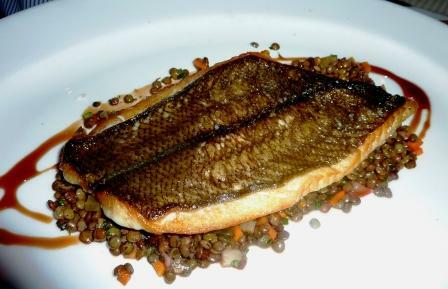 There are a few orders of flounder atop lentils at the table, ordered by men and women alike. The kitchen expertly prepares the fish but this one could use color, and something extra to make the flavors pop. The five women share one raspberry rhubarb shortcake. We each take a bite and aren’t particularly compelled to eat more. We offer the few remaining bites to the men, which means the girls win in the “who’s more generous” competition. At the end of the meal we compare notes with our partners. When it comes to talking about food, the men are more than capable of expressing their feelings. They agree with the women on this one. 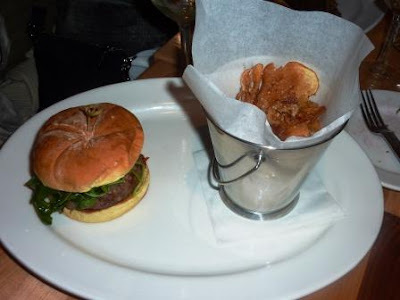 There is something lacking at Food Wine & Co. Unfortunately it’s the food. On the other hand, we are all perfectly happy with the wine and the company. Note: A friend who dines here regularly is disappointed to hear my conclusion about the restaurant. She likes the menu for its simplicity, although she admits that some recent menu changes have disappointed her. Another friend who comes here regularly for the mussels is also a strong supporter. Have an opinion? I would love to know if we were the victims of an off night. A subsequent visit in August 2012 is much better. I have a summer salad with peaches which is delicious and barbecue chicken pizza. Restaurants change quickly and this one is now on my list for a return visit.